Slaughtering animals and processing their flesh is an inherently dangerous industry where company profits consistently take priority over workers’ most basic rights. Today, U.S. slaughterhouses and “meat”-processing facilities employ over 500,000 workers. In their endless goal of higher volume and greater efficiency, these corporations knowingly jeopardize workers’ safety every day. For decades, the state and federal agencies responsible for ensuring a safe and healthy work environment have thoroughly failed to institute and enforce basic labor laws to protect these workers. The result is an industry where corporations set the rules and government agencies follow. Consequently, workers’ most basic rights and interests are compromised and the animals suffer greatly. An unknown percentage of workers are undocumented. Many employers knowingly hire undocumented workers in an effort to satisfy the extremely high turnover rate of the industry, which often exceeds 100% annually. In some cases, they provide incentives for current workers to recruit family and friends and even help new workers to create fake social security cards. Undocumented workers are constantly faced with the threat of deportation – either by their employer or by federal raids. Most workers are “at-will” employees, meaning they can be easily fired at a supervisor’s discretion. The threat of termination discourages workers from reporting safety concerns, injuries, or other serious issues. Supervisors use a variety of intimidation tactics to suppress workers’ concerns and make it clear that other people are always available to replace them. As a result, workers are conditioned to accept a hazardous and demeaning work environment if they want to remain employed. Although slaughterhouses and “meat”-processing facilities are highly mechanized, manual labor is required at several stages of production. Workers are usually trained for one specific part of the process. For example, some workers kill and bleed the animals while others make a series of cuts to separate fat, muscle and bone. Employees are very aware of the dangerous nature of their work. When you combine sharp tools and automated machinery in a high-paced, crowded environment, injuries are inevitable. A variety of U.S. and international labor laws are designed to guarantee workers a safe and healthy work environment free from known hazards. However, slaughterhouse and “meat”-processing workers labor each day in conditions with predictable risks despite the fact that employers are aware of safer alternatives. Consequently, many of the injuries and deaths that workers suffer are preventable. The single largest factor contributing to worker injuries is the speed at which the animals are killed and processed. In an industry where profit margins are slim and volume is everything, workers are endlessly pressured to kill more animals in less time. Rather than regulate line speeds for the interest of worker safety, line speed is limited only by federal sanitation laws. Most facilities operate nearly 24 hours a day 7 days a week – killing and processing hundreds or thousands of animals each hour. As one worker stated: The line is so fast there is no time to sharpen the knife. The knife gets dull and you have to cut harder. That’s when it really starts to hurt, and that’s when you cut yourself. There are other types of manufacturing industries that take great pride in ensuring safe working conditions and even empower workers to shut down machinery when they feel that conditions are potentially unsafe. Slaughterhouse and “meat”-processing workers are made to feel the opposite – even when they know that conditions are extremely unsafe, they work on in fear of being reprimanded by supervisors. The combination of long hours and repetitive motion directly leads to increased risk of injury. The workers suffer chronic pains in their hands, wrists, arms, shoulders and back.Repetitive stress injuries are unavoidable under the frantic pace that most facilities choose to operate. In recent years, the industry has bragged about dramatic reductions in worker injuries. What they’ve failed to report is that the OSHA injury form was recently re-written to omit the category of repetitive stress injuries – the most commonly reported injury in the industry. The corporate mindset is glaring in this worker’s statement: Once the company got fined for safety violations and the manager told us: “Be careful or we’ll have to pay more fines” – not be careful because you might get hurt. When corporations become aware of their workers’ interest in organizing, they often hold mandatory on-the-clock meetings in which employees are lectured on why unions can’t remedy their concerns. Employees can be fired for missing these meetings. Both union and non-union facilities should strive to protect workers from known hazards, pay them a fair wage and treat them with respect. Furthermore, non-union facilities should never deny workers their right to organize and to express freedom of association. Like all agricultural workers, slaughterhouse and “meat”-processing workers struggle to live above the poverty level and provide a decent quality of life for their family. Workers labor long hours in some of the most dangerous working conditions in the country for a relatively low wage. Many female workers also endure acts of sexual harassment perpetrated by co-workers and supervisors. Most workers are in a continuous state of pain due to the long hours and repetitive nature of their work. They feel disrespected and underappreciated as their supervisors are quick to remind them they can be easily replaced. In the case of undocumented workers, the constant threat of deportation creates added stress and anxiety. The repetitive stress injuries that workers endure also have a significant influence on their lives outside of work. Living with chronic aches and pains affects every aspect of a person’s life. Some of the activities that would normally bring great joy to a person, such as playing with their children, are inhibited by injuries suffered in the workplace. 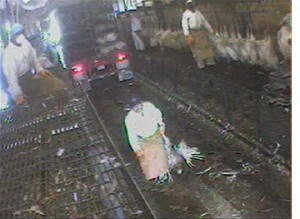 In addition to the chronic physical pains that workers experience, psychologists are becoming increasingly interested in exploring the psychological effects of working in a slaughterhouse.Workers who are responsible for killing animals routinely observe animals being cut and dismembered while still conscious, as well as being skinned and boiled alive. Hour after hour, day after day the workers interact with countless animals in various states of fear and pain. The current state of the “meat”-processing industry is the direct result of corporate greed combined with the thorough failure of state and federal regulatory agencies in protecting these workers. In this industry however, corporate interests consistently take precedence over worker’s safety. OSHA is failing to put these words into action by allowing the “meat”-processing industry to operate as if they were exempt from federal labor standards. In an effort to gain first-hand knowledge into the struggles these workers endure, Food Empowerment Project recently interviewed workers at a local “meat”-processing plant. The workers echoed many of the same safety concerns mentioned in the paragraphs above, such as identifying line speed as the main contributor to unsafe conditions. Multiple workers also expressed concerns that high line speeds directly compromise food quality and can lead to contamination. The workers were hesitant to communicate these concerns to supervisors out of fear of demotion or termination. Every day, “meat”-processing workers are knowingly exposed to serious safety hazards in their workplace. Many of the injuries and deaths that workers experience today are very similar to those first exposed to the general public in Upton Sinclair’s 1906 novel The Jungle. In the years since, the industry has consistently operated with one of the highest injury rates in the country. This is largely due to the fact that state and federal labor agencies have failed to institute and enforce labor laws to prevent known hazards from the workplace. Slaughterhouses and “meat”-processing facilities symbolize suffering and death for animals and exploitation for workers. Fortunately, we can choose not to support this cycle of exploitation and suffering by simply adopting a vegan lifestyle. Food Empowerment Project would like to thank the UFCW, United Food and Commercial Workers International Union, for their support.